The floor upon which the biggest fusion machine in the world will rely on has been constructed. This landmark achievement marks the conclusion of the works that started in August 2010 and represent an investment of around 100 million EUR for F4E, the European Union’s organisation responsible for Europe’s contribution to ITER. The construction has been carried out by a group of companies led by GTM SUD and under the supervision of F4E and the ENGAGE consortium consisting of Assystem, Atkins, Empresarios Agrupados and Egis. The floor will be able to support more than 400,000 tonnes of buildings infrastructure and equipment, including the ITER machine weighing 23,000 tonnes. Professor Henrik Bindslev, Director of Fusion for Energy (F4E), explained that “Europe is taking the ITER construction to the next level. The basemat is the test bed of the biggest international collaboration in the field of energy. It’s where the scientific work and industrial know-how will come together and be deployed to seize the power of fusion energy”. Professor Osamu Motojima, Director General of ITER International Organization (ITER IO) stated that “the conclusion of this task is a historical moment for the project. Years of hard work by all ITER parties are bearing fruit as the facility takes shape and makes progress on all fronts”. The basemat is far more complex that it seems. It has a surface of 9,600m2 and a thickness of 1,5 m of reinforced concrete consisting of four successive layers - two of 50cm, one of 30cm and one of 20cm. The first of the fifteen plots of concrete was poured in December 2013. Following the approval of the French Nuclear Authority in July 2014, regarding the robustness of the building design, nine central sections of the slab were poured within seven weeks leading to a successful completion of the works in late August 2014. In total 150 workers were involved in this operation, using 14,000m3 of concrete, 3,600 tonnes of steel and 2,500 embedded plates. A web of 493 plinths coated with pads, lies beneath the upper slab, able to absorb the effect of an intense seismic shock. More concrete and thick steel rebars form a mesh to keep the foundations stable and lift the immense load of the machine. The design and validation process have been extremely challenging because the basemat will be the floor of the Tokamak building that will house the machine and shield it. For this reason it is has been subjected to heavy scrutiny from ITER IO and the French Nuclear Regulator. 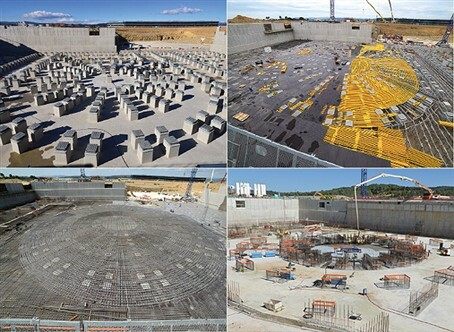 The infrastructure fully complies with the set of nuclear safety requirements branding ITER as the biggest nuclear facility in France and the first ever nuclear fusion facility in the world. How will the ITER site evolve? With the ITER basemat now completed, the construction of the complex that will house the core buildings of the machine has started. The VFR consortium, consisting of VINCI Construction Grands Projets, Ferrovial Agroman, Razel-Bec, Dodin Campenon Bernard, Campenon Bernard Sud-Est, GTM Sud and Chantiers Modernes Sud are responsible for carrying out the works. The building will be 80 metres tall, 120 metres long and 80 metres wide. It will require 16,000 tonnes of steel rebars and 150,000 m3 of concrete. There has also been progress at the Assembly Hall building, where the massive ITER components will be put together. The steel structure of the building has become visible and so far the lower sections of the eight first columns have been erected. They weigh around 15 tonnes and are currently 12 metres high (once fully erected they will be 60 metres high). The temporary road network, infirmary and restaurant have also completed making it possible for the contractors to set up their company offices on the site.